For the first time ever summer program in Bangladesh. The International Social Business Summer Program 2017 (ISBSP) was held from July 22 to August 1, 2017 in the lush green campus of Daffodil International University (DIU) with the motto “Social Business Entrepreneurs for Better World”. 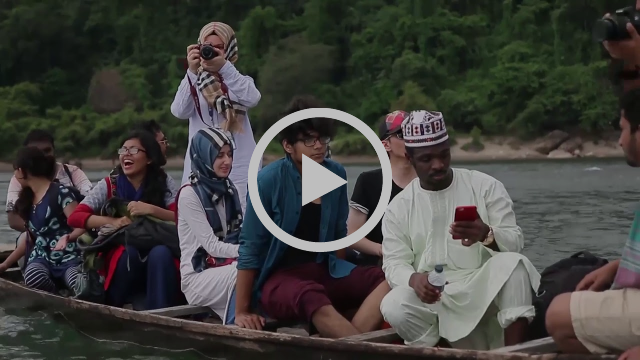 Young minds from eight different countries that are China, Turkey, Indonesia, Nepal, Malaysia, Nigeria, Somalia and Bangladesh came together to learn how to solve world's most pressing issues by using the power of business. ISBSP participants were welcomed by a colorful opening ceremony on July 22 including Ice breaking session and traditional Bangladeshi music presentation. Professor Dr. Yousuf M. Islam, Honorable Vice Chancellor of DIU, Professor Rafiqul Islam, Dean, Faculty of Business and Economics, Professor Dr. Farid A. Sobhani, Dean, Human Resource Developement Institute, Mr. Mohammed Masum Iqbal, Associate Professor and Head, Department of Business Administration, Dr. Md. Fokhray Hossain, Director, International Affairs and many other faculty members and distinguished guests were present in the opening ceremony. "You can make a lot of money and be happy about it, but that kind of happiness will not be everlasting. For me, happiness because of richness and full of money is just temporary and not fulfilling. I am happy when I make other people happy by helping the poor and the devastating ones and this kind of happiness is forever". Participants of ISBSP paid a courtesy call with Nobel Laureate Professor Muhammad Yunus at Yunus Centre on August 01, 2017 for a sharing session. After the session Professor Yunus handed over the certificate of participation among the participants. Social Business is a next generation business developed by Nobel Laureate Professor Muhammad Yunus. In a social business, you can invest but can’t take any dividends. You can take all of your investment but after you have taken back the last penny it stops. Company continues to earn profit but it’s not your profit, company’s profit. Company continues to expand because it’s driven by the social objective rather than profit maximization said Mr. AKM Zaid Uddin, Asst. Program Officer, Yunus Centre during his lecture on Social Business & It’s Chemistry at ISBSP 2017. Masud Ibn Rahman, Associate Professor & Director, YSBC, DIU taught the technique of creating global partnership in a session entitled Social Business in Global Platform. Participants learned the tools for improving the planning, implementation, management, monitoring and evaluation of projects in a session named Log Frame of Social Business taken by Mr. Farid A. Sobahani, Dean, Human Resource Development Institute. “If given institutional opportunity, the poor can not only change their own lives through their own efforts in a sustainable way, they can also contribute to changing society” said Qazi Nazrul Huque, General Manager, Grameen Shikkha during his session on Grameen Bank: Type II Social Business. Dr. Anne W. Bunde-Birouste, Director, Yunus Social Business for Health Hub, Australia described the mechanism of crowd funding in a session Sport for Social Change (S4SC) where Professor Luisa Brunori, Founder, Grameen Italia, Professor Giuseppe Torluccio, University of Bologna, Italy took few sessions on Social Business & Microfinance. “You have to dream big to be a Social Business Entrepreneur. Understanding & realizing the social problem is much more important before planning a social business venture” said Mai Thi Thanh Thai, Associate Professor of HEC Montreal, Canada in a session named Social Business Creation. Mr. Chien-wen Shen, Associate Professor & Director, Yunus Social Business Centre, National Central University, Taiwan taught how to scale up the social impact in a session on Social Return on Investment (SROI) where Mr. Fabio Andres Rodriguez, Project Coordinator, UNDP Bangladesh talked on how to utilize Youthopia.bangla a global platform for young social entrepreneurs to create impact. Hard work with credibility is the most success factor for a Social Entrepreneur and if you want to be a Social Entrepreneur make your idea simple & avoid complexity urged Mr. Md. Sabur Khan, Honorable Chairman, BoT, Daffodil International University during his session Social Entrepreneurship in Action. Dr. Yousuf M. Islam, Honorable Vice Chancellor, DIU conducted a session on Mind Mapping and ICT for Social Entrepreneurs. Participants got hands on experience on how to create mind maps for a successful social business venture. Mr. Syed Mizanur Rahman Raju, Associate Professor & Director, Students’ Affairs, DIU conducted a session on Art of Living and Mr. Md. Kamruzzaman, Senior Lecturer, DIU organized a collaboration and mind game session. Human being equals to not only body. A vital part of human being is soul. And need of their soul is continuous happiness. Thus cost of unhappiness can be more expensive than anything. Said Mr. Ejaj-ur Rahaman Shajal, Lecturer & Assistant Director, Students' Affairs, DIU in an interactive motivational session entitled gross national happiness. Participants were given a group work to design a social business idea of their own in a session entitled Design for social business(D4SB) conducted by Mr. Mohammad Shibli Shahriar, Associate Professor, DIU. In this esteemed summer program, there were more than 20 sessions conducted by renowned professors, academicians and social business activists from Australia, Italy, Canada, Taiwan, Colombia and Bangladesh. The affection of nature and beauty of Bangladesh is appealing always said Ms. Duygu Bostanci, a Turkish participant where Mr. Jaryn Jingyuan Huang, a Chinese participant said it was a wonderful experience to meet local and tribal inhabitant. Both of them shared their experience of visiting Srimongol & Jaflong, the famous tourist spot of Bangladesh. The program was not only limited to classroom premises but to know about Bangladesh and its culture by visiting heritage and tourist places like National Memorial, National Parliament, Hatirjheel (is a lakefront in Dhaka, Bangladesh that has been transformed into a transportation medium for minimizing traffic congestion), Dhaka University, Jahangirnagar University & Old Dhaka. There were plenty of outdoor activities like Golf course, Football matches, Pool, campfire, Bar-B-Q party, fireworks and open air film show. These activities helped the participants to get into a Learning with Joy environment. Participants of ISBSP 2017 got hands on experience on social business through class lectures and field visits in various social business organizations like Grameen Caledonian College of Nursing (GCCN), Grameen Bank and Yunus Centre. The participants also visited the Headquarter of Centre on Integrated Rural Development for Asia and the Pacific (CIRDAP) in an open house session. Ms. Eva Benita A. Tuzon, Director, Pilot Projects (CIRDAP) conducted a session on How CIRDAP is creating impact in the Asia & the Pacific. August 1, it was the last day of the ISBSP 2017 with an enthusiastic closing ceremony. Mr. Md Sabur Khan, renowned entrepreneur of the country & Honorable Chairman, BoT, DIU was the Chief Guest of the closing ceremony. He highly encouraged the participants and shared his ideas with participants so that they can apply to form social businesses. With his inspiring words for the entrepreneurs, the 10 day long first ever summer program for social business came to a conclusion followed by grand dinner and cross cultural performances. ‘SATAK’, a Bangladeshi band performed renowned folk songs.